Home » What does the SGF do? What does the Space Geodesy Facility do? The SGF produces geodetic data by three different techniques that are complementary and are co-located on a single site. The SGF operates a Satellite Laser Ranging (SLR) station, Global Navigation Satellite Systems (GNSS) sites and a permanently installed Absolute Gravimeter (AG). The SGF tracks a variety of different scientific satellites. 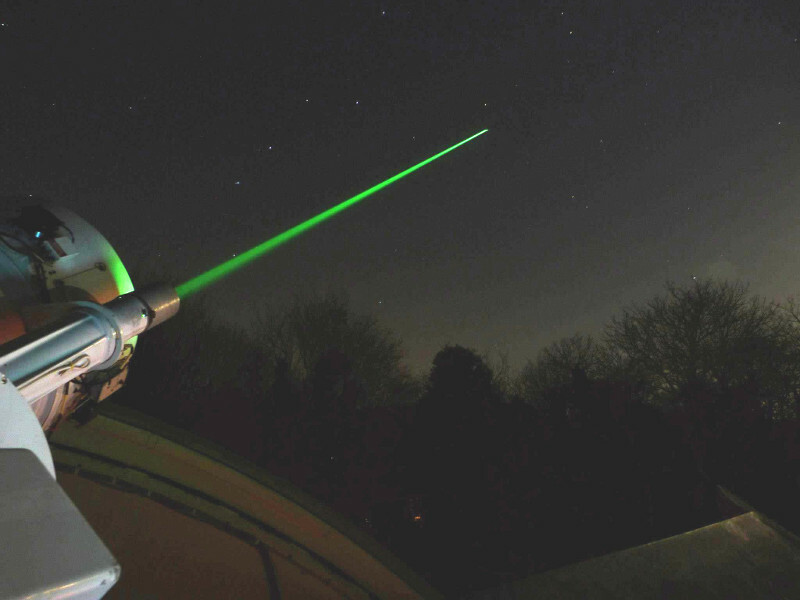 As as a satellite passes over Herstmonceux it is tracked by the telescope and short pulses of green laser light are fired. These pulses travel through the Earth's atmosphere and illuminate the satellite and the onboard retro-reflector target, which reflects the light straight back to the station. A few 10s of milliseconds after firing, the returning laser light is detected through the telescope and a “time of flight” distance measurement is recorded. This technique is capable of tracking a satellite to an accuracy of approximately 1 centimetre and contributes to the calculation of precise orbits. The vast majority of the 100 million billion photons in each laser pulse are lost and only a few returning photons are detected. The single wavelength property of the laser light, 532nm, allows the facility to operate day or night by filtering out noise, including daylight, so that only the green laser light reaches the detector. SLR satellites vary in height from 400km to above 20 000km and can take from a few minutes to many hours to travel across the sky. A SLR satellite has a well defined orbit that allows the NSGF telescope to steadily track it to within a thousandth of a degree. Given clear skies, SLR is in continuous operation. The SLR site at the SGF is unique in the UK and a major system in the International Laser Ranging Service (ILRS) global network of around 40 SLR stations. These stations track the same satellites over different points on the Earth’s surface. The data produced by the ILRS network is used by the satellite mission providers. In the case of geodetic satellites, amongst others the data is used by ILRS analysts. GNSS satellites continually broadcast their positions and time according to their onboard atomic clocks. The delay in receiving these broadcasts is clear from comparing the broadcast times with the receiver clock, with the more distant satellites giving greater differences. Site coordinates can be determined in 3 dimensions from these delays when at least 4 satellites are visible. The facility operates two IGS GNSS reference sites, HERS and HERT, which continually track the GPS and GLONASS satellites visible in the sky over the SGF throughout each day. This data is submitted to the International GNSS service (IGS) and used along with data from sites around the world to calculate site coordinates, satellite orbits, clock offsets and Earth orientation parameters. The receivers operate independently and reliably but are monitored each day. The SGF GNSS data is also archived and made available through the NERC-funded British Isles continuous GNSS Facility (BIGF). In addition, one SGF receiver (HERT), as part of the EUREF network, is also a EUREF Real-Time data-provider, streaming data directly into the internet for real-time navigational applications. 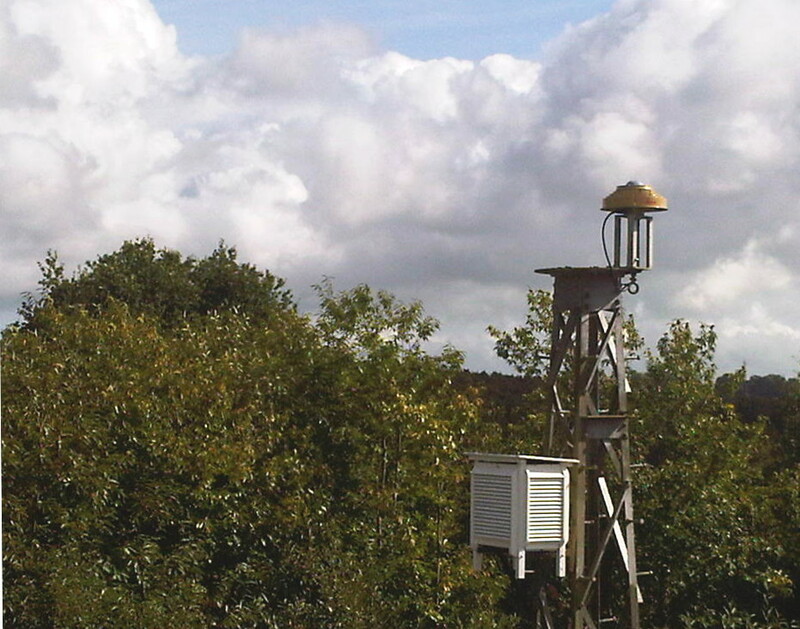 A third GNSS site is hosted at the SGF which is an Ordnance Survey (OS) GeoNet 'zero-order' GNSS reference stations, named HERO; 12 of these sites are now established in the British Isles and GeoNet is set to become the new definition of ETRS89 for the UK. An object falls to Earth because of the accelerating force caused by the Earth's gravitational pull. This accelaration is precisely measured by the absolute gravimeter installed in the basement of the SGF in 2006, which interferometrically tracks by laser a falling mass in a vacuum. 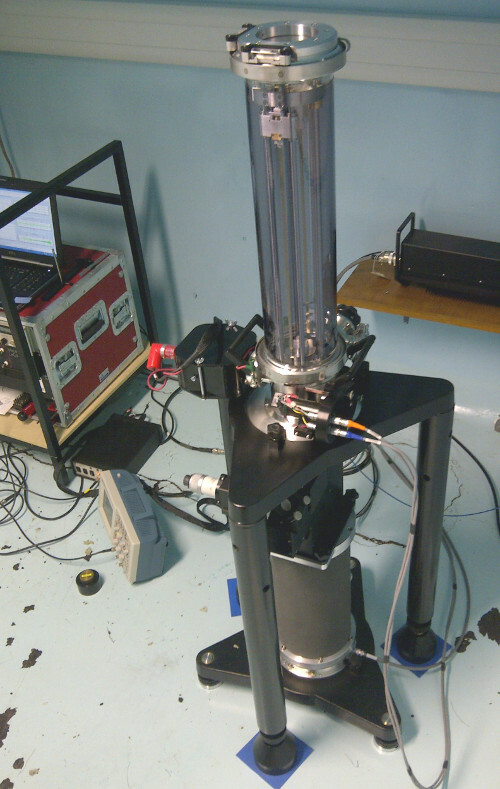 The accelaration g is measured at the SGF to be about 9.81124000 m/s2, with an accuracy of 2 microGal. The unit ‘Gal’ was named after Galileo and 1μGal = 1x10-8 m/s2. An 'experiment' consists of hourly sets of drops that are combined to give an average value of the local gravitational acceleration along with an error estimate. For high precision measurements the object is dropped numerous times and the weighted average taken. Key to the precision of measurements obtained by an FG-5 is the long period isolation (60s) ‘superspring’ which decouples the system from the Earth’s natural seismic activity and provides an inertial reference frame. The ‘super-spring’ is in essence a seismometer and events such as Earthquakes are particularly clear in the AG data. High precision measurements of the Earth’s acceleration due to gravity can be used to reveal vertical movement of crustal deformation and mass changes beneath our feet.